Brunch was big in the ’80s, overhyped in the ’90s, maligned in the aughts. But now chefs are making it truly great. I've always gone out for brunch for reasons that had more to do with spicy Bloody Marys than with food. I obsess endlessly about where to eat dinner; at brunch, all the menus seemed the same. 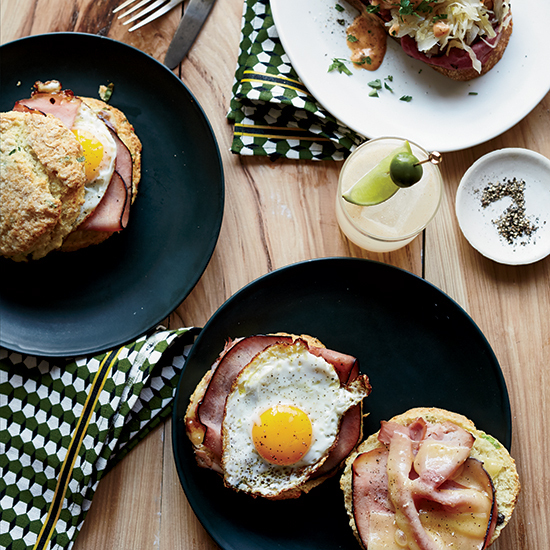 This spin on eggs Benedict from Josh Habiger at Nashville’s Pinewood Social has all the beloved elements of a Reuben sandwich. Besides corned beef, sauerkraut and rye toast, he makes a Thousand Island–style hollandaise sauce. “Scallions are so great with eggs,” says Will Gilson, chef at Puritan & Company in Cambridge, Massachusetts. He adds them to the biscuits he fills with ham, cheddar and fried eggs; they’re one reason the breakfast sandwich is so good. For brunch at Miss Lily’s in Manhattan, chef Adam Schop sprinkles a little shredded coconut onto the pancake batter as it cooks on the griddle, so the coconut gets nicely toasted. The finished pancakes get a layer of extra coconut before serving. “Quinoa gives granola a nice, unconventional little crunch,” says Amanda Rockman, pastry chef at Chicago’s Nico Osteria and the force behind many of the hotel restaurant’s great brunch dishes. She serves her granola with creamy ricotta; plain yogurt is great, too. At Superba Food + Bread in Los Angeles, brunch prep starts at 2:30 a.m., when the bakers arrive. Some of the most popular items are these muffins, into which chef Lincoln Carson bakes a nugget of pimento cheese. This version features the pimento cheese ingredients mixed in, so you get cheesy, peppery flavors in every bite. Seasonal quiche is a favorite on the new brunch menu at Cakes & Ale in Decatur, Georgia. Among chef Billy Allin’s winter favorites is this one, packed with brussels sprouts and cheese.